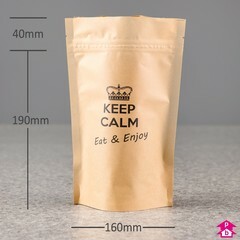 These printed versions of our plain brown biodegradable food pouches feature the classic 'Keep Calm' design. 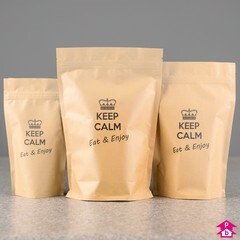 Printed in black, they have a crown with the words 'Keep Calm Eat & Enjoy' on the front with a bio logo and 'For a better world' on the back. 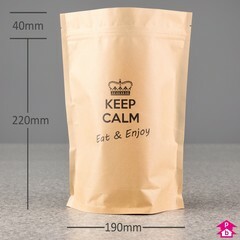 Food safe eco-friendly compostable alternative to traditional packaging. Made with 45% - 60% renewable wood pulp starch. Biodegrade to compost in 3 months when placed into a composting environment. Range covers 325ml up to 1.4 litres volume. Resealable press-to-close strip that helps preserve freshness. The bottom gusset allows the pouches to stand independently on the shelf. Pouches pack together efficiently for storage. Pouch header can be sealed with a standard heatsealer. Handy tear-off notches for an easy first opening when heatsealed. 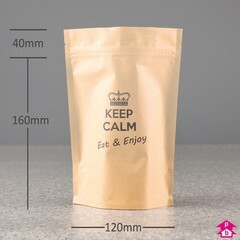 Suitable for most food products.